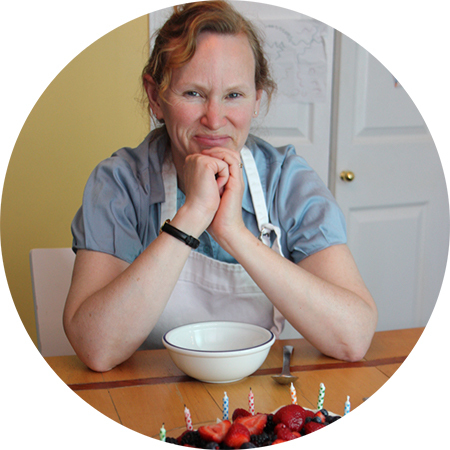 Hi, my name is Suzanne and welcome to my culinary blog. I hope you find something that interests you in here. I have never studied cooking or baking. I learned a lot of my culinary knowledge from my Mum and then later on from reading Gourmet magazine while commuting on the Toronto subway. I have a degree in Applied Human Nutrition from the University of Guelph. I am married and have two sons; all of whom are the best taste testers. We live in Ottawa, but I have also lived in Toronto, Waterloo, Stratford, Guelph, Halifax, and Spruce Grove, AB. I love anything made with nutmeg, ginger, cardamom, honey, vanilla and butter. I bought my first cookbook, Peanuts Cook Book, at the age of 9. My favourite baking right now is British, Scandinavian, Italian, French and Persian. My friend, Bonnie, and I travelled for one year after High school, to Europe, Northern Africa, and Scandinavia and visited a lot of bakeries! I still love travelling. I always travel with a few food magazines. I love planning future meals or desserts almost as much as makng them. I love to research and write about recipes from other countries around the world. I do have recipes on my blog for my favourite scones, muffins, or irish soda bread because I make those too . But my real passion are recipes that aren’t very common to North Americans, such as Armenian Red Lentil and Apricot Soup, Syrian Muhammara Red Pepper Dip, Lancashire Maple-Oat Parkin Cake or Mocha, Almond, Brandy Strazzate. Serve any of these recipes at a potluck and everyone will want the recipe. I also love learning about the history or special traditions associated with these recipes. Every food has a story. So, if you’re looking for recipes and stories that are a bit off the beaten track, you’ve come to the right food blog. I also do collaborations. So send me an e-mail if you’re interested.